Members of the Pflugerville City Council are the latest Texans to put a new asphalt alternative to the test. The city joins Austin and the Texas Department of Transportation (TxDOT) in deciding to experiment with Terra Pave for jobs where asphalt would have been used in the past. Terra Pave says its products are “much stronger” than asphalt and stay flexible at most temperatures. That allows them to “remain strong and resistant to deformation by both traffic loading and environmental forces such as heat, cold, rain and freezing.” Finally, Graff points out that no special equipment is necessary to apply Terra Pave. It can be placed with conventional paving equipment. Because the polymers used in Terra Pave are clear when they dry, the products can take on the color of any pigment added. Graff says carbon black is added to many of the Terra Pave products to make them look like conventional asphalt pavements and give them good UV light resistance. 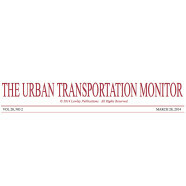 However, the company expects to develop some material in blue or green in the near future for a test bicycle lane. Earlier this year, Pflugerville voted to go with Terra Pave to save money on the construction of 37 new parking spaces and test its spirit of innovation by taking a risk on what it viewed as a more environmentally friendly product. Austin is currently testing Terra Pave in one of its parking lots, too, and TxDOT applied it last year on SH195. 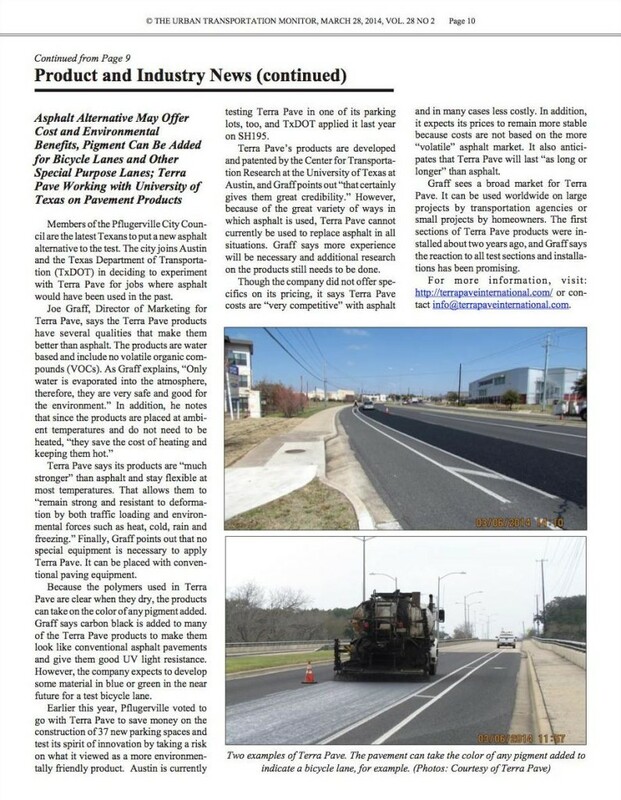 Terra Pave’s products are developed and patented by the Center for Transportation Research at the University of Texas at Austin, and Graff points out “that certainly gives them great credibility.” However, because of the great variety of ways in which asphalt is used, Terra Pave cannot currently be used to replace asphalt in all situations. Graff says more experience will be necessary and additional research on the products still needs to be done. Though the company did not offer specifics on its pricing, it says Terra Pave costs are “very competitive” with asphalt and in many cases less costly. In addition, it expects its prices to remain more stable because costs are not based on the more “volatile” asphalt market. It also anticipates that Terra Pave will last “as long or longer” than asphalt. Graff sees a broad market for Terra Pave. It can be used worldwide on large projects by transportation agencies or small projects by homeowners. The first sections of Terra Pave products were installed about two years ago, and Graff says the reaction to all test sections and installations has been promising.